Limited 1 year warranty on manufacture defects. For details, call 514-443-8883. The Brondell H2O+ Circle RO Water Filter's exclusive Smart Valve and unique circular reservoir design are the keys to its efficient design. This technology reduces wastewater to an average of approximately 2L for every litre of drinking water - up to over 10 times more efficient than many conventional RO systems. The Circle's refill rate is more than twice as fast as non-electric systems and equally as fast as those with electric pumps. It offers simplified installation and maintenance with features such as auto-flushing, twist and lock filter changes, and "quick-connect" connections. The Circle Reverse Osmosis System utilizes 4 separate water filters dramatically reducing industrial chemicals, heavy metals, pesticides, herbicides, total dissolved solids (TDS), volatile organic compounds (VOCs), microorganisms, bad tastes and odours. The Circle is the fastest, easiest, most elegant and efficient high quality reverses osmosis system available for a healthy home and family. The Coral Single-Stage under counter water filtration system is a great solution for small households who want powerful water filtration in a small footprint. The Coral UC100 includes an elegant, designer chrome faucet with an integrated LED filter change indicator that reminds you when it's time to change the filter. The Coral UC100 system is tested and certified by WQA (Water Quality Association) to NSF/ANSI standards 42 & 53 for the reduction of Chlorine, taste and odour, Chloramine, Particulate Class I Particles, Cysts, Mercury, Lead, MTBE, Turbidity, Asbestos, and a full list of VOCs (see our Performance Data Sheet for the full list of contaminates reduced). The system has also been tested and certified by WQA according to NSF/ANSI 372 (low lead compliance) and CSA B483.1 (Canadian requirements). The Coral Three-Stage under counter water filtration system is a great solution for larger households that want best-in-class water filtration with a small, convenient footprint. The Coral UC300 includes an elegant, designer chrome faucet with an integrated LED filter change indicator that reminds you when it's time to change the filters. The Coral UC300 system is tested and certified by WQA (Water Quality Association) to NSF/ANSI standards 42 & 53 for the reduction of Chlorine, taste and odour, Chloramine, Particulate Class I Particles, Cysts, Mercury, Lead, MTBE, Turbidity, Asbestos, and a full list of VOCs (see our Performance Data Sheet for the full list of contaminates reduced). Delivering the convenience of sleek design coupled with powerful triple-filtration technology, the Brondell H2O+ Cypress Countertop Water Filtration System eliminates wastewater, storage tanks and complex installation. The system installs in under 10 minutes with the provided diverter and fits 99% of home faucets. Alternatively, you can install the water connection under your sink with an available T-valve (sold separately). In about the same time and ease as changing a light bulb, you can enjoy continuous, refreshing filtered water at the push of a button. The system utilizes three separate advanced water filters, dramatically reducing industrial chemicals, pesticides, herbicides, turbidity, volatile organic compounds (VOCs), microorganisms, bad tastes and odours. It also reduces harmful chemicals like atrazine, chlorobenzene, trihalomethanes, methoxychlor, endrin, 2,4-D, benzine, DBCP and aesthetic chlorine, promoting a healthier home and family. Whole House Stainless Steel Water Filtration System Gamma CasaWater whole house stainless steel water filtration system provides purified water at every source in your house. 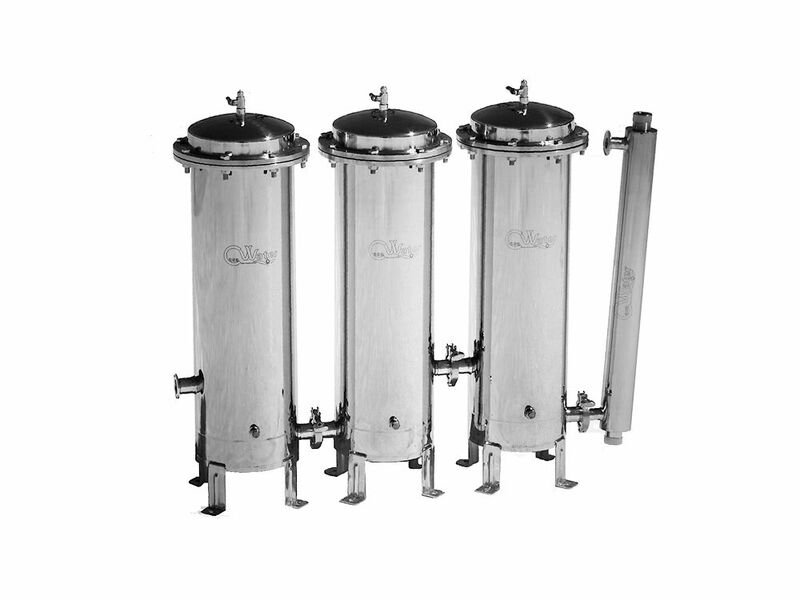 The water filtering process consists of several stages dealing with numerous contaminants such as: dirt, sediment, rust particles,etc; chlorine, bad taste and door, lead and heavy metals, etc. ; organic chemicals, etc. ; common bacteria, viruses and spores, etc.